Hey Everyone! I know it's so shocking to see me back so soon. I am trying to get myself back into the habit of more regular posting, and maybe posting multiple times a day and then setting a timer to post them will help...I'm not sure. Im going to try everything in my power to get back on track like before, so hopefully this works. Anyways...enough rambling! I made this card quite a while back, and haven't had a chance to post it yet unfortunately. It is so cute, and something different from what I am used to doing. 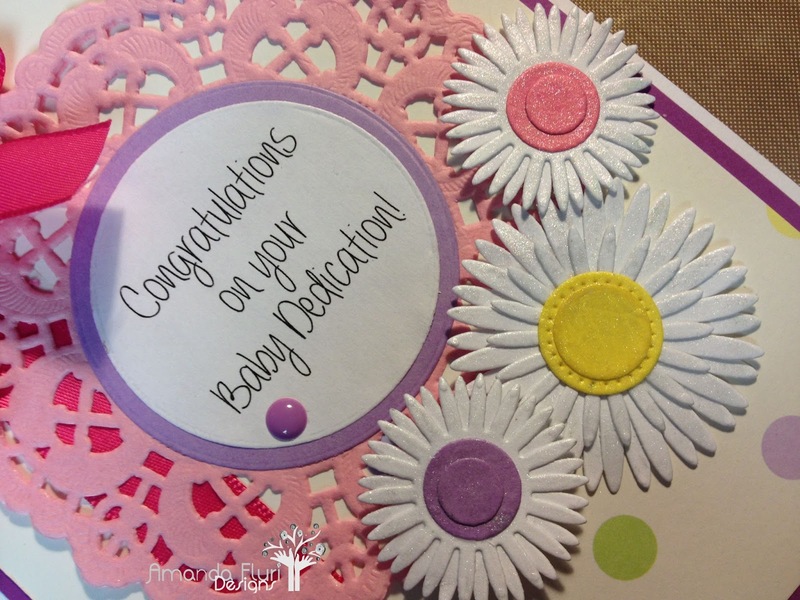 Usually I design a card with a stamped image as most of you know, and this one I didn't. I used my die cut machine and cut out quite a few elements for this card. I also used a ton of embellishment products and techniques. This card was on that I initially struggled with. 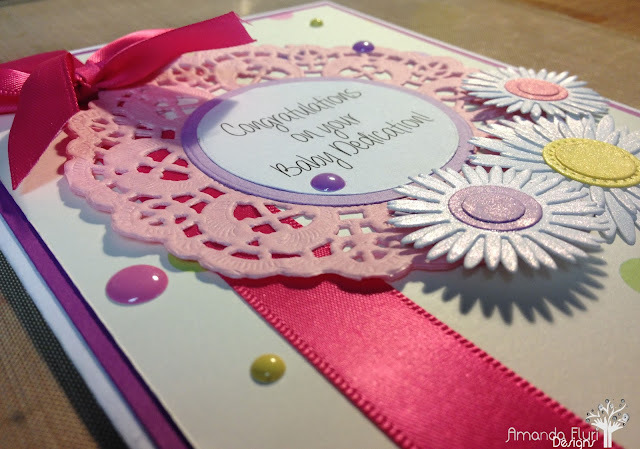 I cannot even tell you how many times I started this card over and over again, but finally I was able to put something together that I liked, and the card just came about because of it. 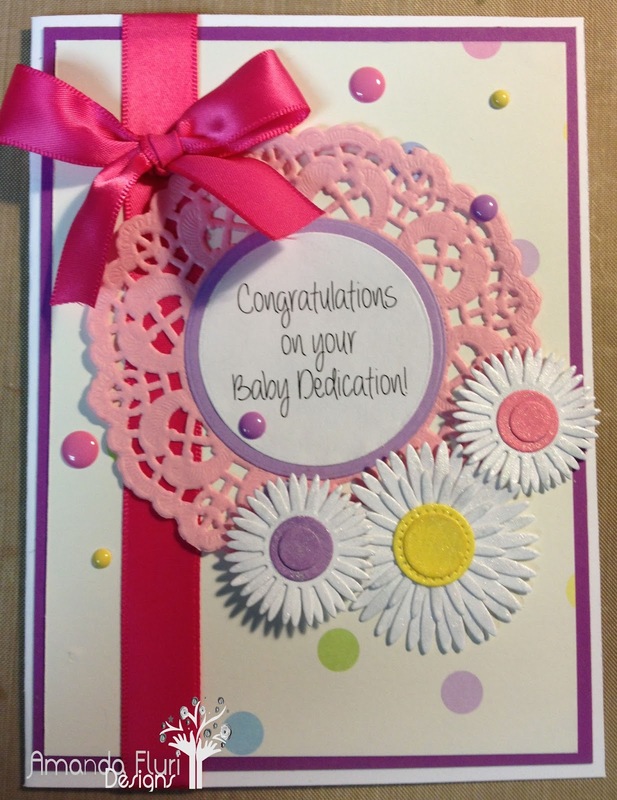 The card was for a little girl that was being dedicated and I was asked to design a card for the special occasion. What an honour! I hope that they loved the card, and I am sure the dedication was a very special event. White Cardstock - used for the card base, and the paper for the Gerbra Daisies as well as the paper that the sentiment is printed on.